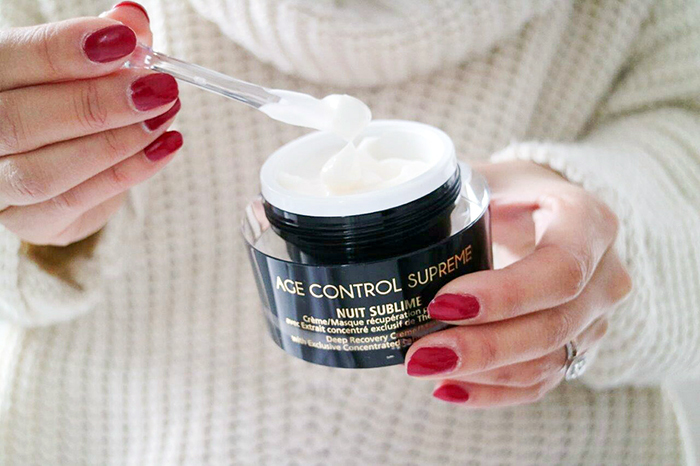 Do you change up your skincare routine during the harsh winter months? What about your diet? Do you consume foods that will help you nourish your skin? Well, if you’re not already doing so, think twice! During the cold months while you’re exposing your skin to the chill air and gusty winds, your skin can experience increased dryness, redness, and dehydration. It’s so important to modify your skincare products so that they can help you battle those challenges! 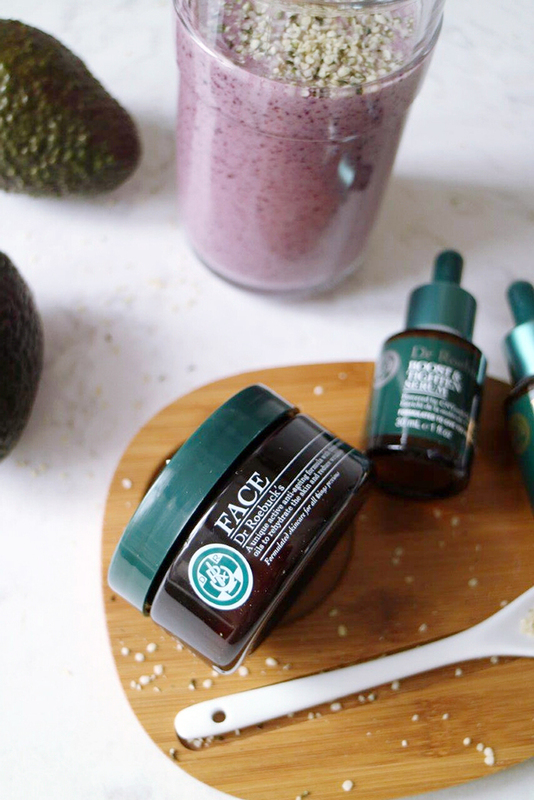 In addition to stocking up your vanity with some supercharged items, it’s also a great time to add some extra wholesome and hydrating items to your diet to combat winter skin inside and out! 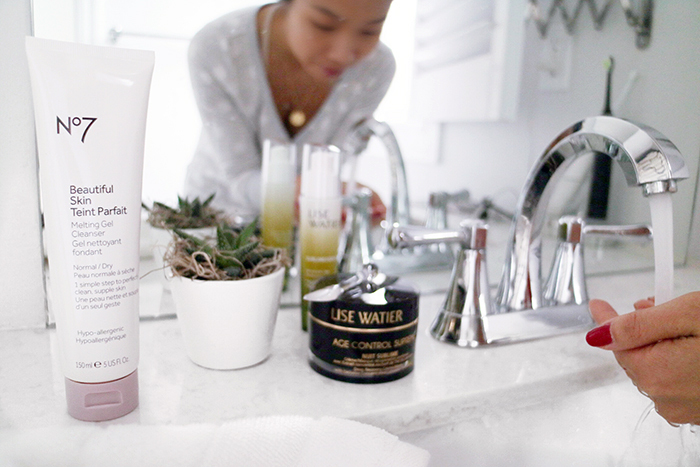 Read further to learn about some of my newly-added Winter Skincare and Beverage Pairings from Shoppers Drug Mart and President’s Choice! Earlier this month, I visited the Shoppers Drug Mart beautyBOUTIQUE at Bloor and Runnymede. First off, for those of you living in Toronto, if you’ve not yet visited this store, GO! NOW! It’s absolutely stunning and you’ll find yourself playing with all the makeup for hours. I met with in-house Beauty Expert and esthetician Ross White for a private skincare consultation (this is also a complementary service when you visit the beautyBOUTIQUE). My skincare consultation visit revealed that I had slight pigmentation and slightly dryer skin in my forehead area. Therefore, Ross recommended some great products to me and also treated me to an in-chair facial and hydration mask application! Double Glow Peeling Mask Leaves skin glowing and radiant thanks to Vitamin C and its AHA and volcanic stone exfoliation. Pore Purifying Clay Mask Cleanses and refines pores thanks to Kaolin and Bentonite clay, leaving the skin feeling purified. Quenching Mineral Mask Instantly hydrates and soothes, while leaving skin feeling fresh thanks to its mineral rich formula and liquid gel texture. 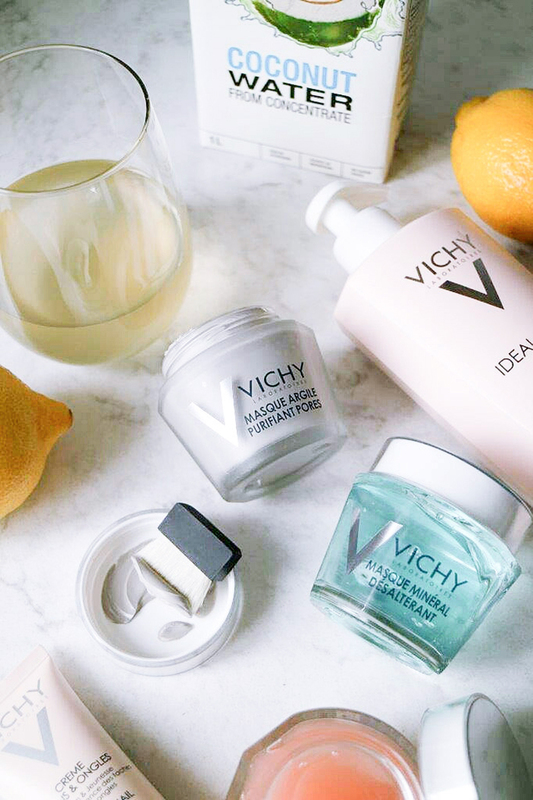 If you’re also interested in giving the rest of your body some TLC, the Vichy Ideal Body Serum-Milk Serum-milk is perfect for all skin types and will also add firmness, smoothness, and hydration to your body. When it comes to dryness and dehydration, it’s equally important to hydrate from within. That means drinking lots of H2O! I love PC Coconut Water from Concentrate as an alternative. It’s delicious and has just as much benefits as drinking water! I also shared with Ross that I had some minor concerns with aging skin. He stressed the importance of applying a serum (which I have to admit I’m not that religious with!) and finding the perfect night cream. I was recommended the Lise Watier Sublimessence High Concentration Age-Defying Serum which is said to show visibly younger skin in just one week. This serum is made with the highest concentration of exclusive Labrador Tea extract and the Active Cell Infusion Complex boosts the efficacy and absorption of actives which means your skin will benefit from where it needs it the most! 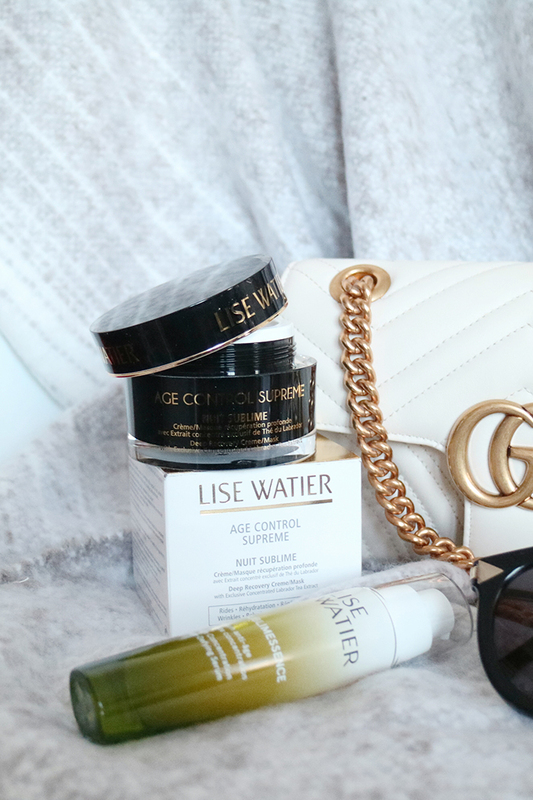 In terms of a heavy duty night cream, the Lise Watier Age Control Supreme Nuit Sublime was added to my list. I mean, the word sublime just says it all! This night cream can also double up as a mask and its overnight power will deliver nourishment, hydration and smoothness while we’re snoozing. I can’t wait to put this product to use! I’ve paid very little attention on the type of face wash during specific seasons. Did you know that cleaner types such as foam, gel, or cream can make a difference to your skin depending on the change in season? Since I’m experiencing dryer skin, a gel cleanser would be most desired compared to that others. The No7 Beautiful Skin Melting Gel Cleanser Normal/Dry is a great (and inexpensive) refreshing gel cleanser that transforms into an oil as you massage into your skin. It dissolves make up and impurities to help keep skin looking clear and healthy. As you continue to massage it into your skin, it will turn into a milk leaving no residue. For those of you who care deeply about products that are free of BPA, Parabens, and harmful fillers and chemicals, Australian brand Dr Roebuck’s is a great fit. They were first developed in 1978 by physicians who were looking to treat Eczema of their twins, and soon, Kim and Zoe (the twins) continued to expand the Dr Roebuck’s skin-care line. Since I’m interested in proactively adding the ‘serum’ stage to my routine, I’m particularly drawn to Dr Roebuck’s Reverse Aging Serum and Dr. Roebuck’s Boost & Tighten Serum. The first is proven to reduce the appearance of wrinkles and fine lines while the other will give your skin an overall boost and help tighten damaged skin. 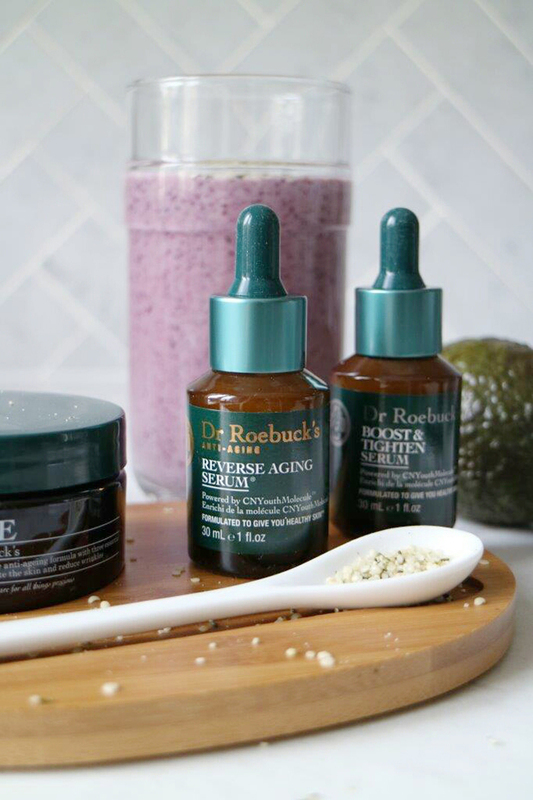 The Dr Roebuck’s FACE can be added as a step post-serum, since it is an everyday facial skin care remedy with a unique active formula, it’s the perfect way to rehydrate the skin and reduce wrinkles while using essential natural skin care ingredients. As part of my beauty skincare practice, I love to also wake up to a nutritious breakfast. A breakfast smoothie is just the perfect addition and when you add powerful superfoods. One of my much-loved option is a Blueberry Avocado Smoothie! Often times, fruits can spoil quickly, and if you’re on the run like me, having pre-frozen, ready-to-use options such as PC Avocado Chunks and PC Frozen Canadian Wild Blueberries will make your life that much easier! I recently tried the PC Plain Kefir Probiotic Fermented 1% M.F. Milk instead of using regular milk in my smoothie and it was fantastic. Kefir is made with 12 different bacterial cultures and provides 2 billion probiotic live active cultures per 250 mL serving. Whether you are keen to enjoy it by the glass or mix into your smoothies, it’s such a great way to reap the benefits of probiotics, and it’s an excellent source of calcium. I hope you’ve found a few products in this post that will help you combat those winter skin concerns as well! Be sure to visit Shoppers Drug Mart beautyBOUTIQUE and ask a beauty expert to recommend products that are perfect for you!